Sporting goods giant Adidas is adding a “lace jewel” with an embedded NFC chip to its Boost running shoes, enabling shoppers with an NFC phone to tap it for detailed product information and to see reviews. The system uses NFC specialist Thinaire‘s platform and is now live in stores in New York and California. The NFC jewels are branded, decorative tags which are threaded onto the shoe’s lace. On-shelf placards in stores inform customers that they can tap the jewel with their NFC phone for further information and store assistants are also being equipped with NFC phones which they can use to register a customer’s purchase. “This is something that is live in the market right now and where I think retail is going and it’s something very, very exciting,” Thinaire co-founder Tim Daly revealed during NFC World’s Tap-to-shop: NFC in Retailing webinar. “So, you’re interested in the shoe, you go to the retailer, you tap your phone to the front of this lace jewel and up comes a very rich, robust, sales experience. Customers can also read reviews from the top running magazines, as well as live social networking feeds from a combination of platforms including Facebook, Twitter and Instagram when tapping the jewel. Daly continued: “So, you have now decided that you are going to purchase this shoe. You take it up to the sales associate and they take a unique NFC device with a custom app that we have built for them on it. “They tap the very same NFC-embedded lace jewel and that shoe is then encoded with the POS system, removed from the inventory and is now ready to be associated with the new owner. “So, you take the shoe home, you take your own mobile device and tap the same lace jewel again and it brings up a registration screen where you are able to register and associate the shoe with yourself. 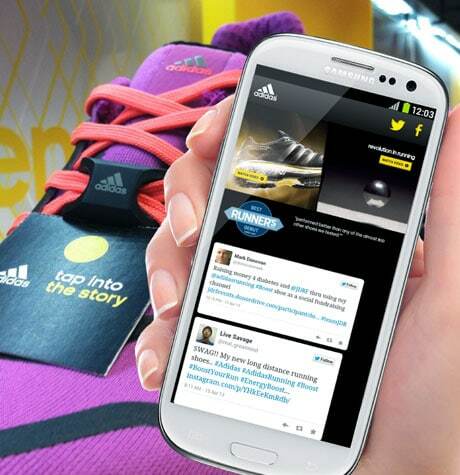 “It will coordinate with the existing Adidas miCoach running app and other products they have. It will coordinate and link with all of your social feeds if you would like it to. It will also offer an online custom mobile commerce experience, where you will be offered unique content and things that coordinate and support that shoe.